Last comment was posted 2 hours, 12 minutes ago. Beachbum Berry’s Grog Log continues to fill me with the lust of the tiki. And even though my epic quest to acquire demerara rum in Pennsylvania continues to thwart me in every direction (save one, which will not be spoken of), there are still many recipes that I can make from the wondrous tome. I just finished up a post on the Singapore Sling where cutting out or simplifying ingredients resulted in a drink with less complexity and interest. Darcy over at The Art of the Drink does a great and amusing job of stressing the importance of quality ingredients and not skipping out to make things simpler on such a drink. But fortunately, it is not always so. Some recipes do indeed benefit from simplicity. The Hurricane is one of those recipes. I was a bit surprised, however, when I read the Grog Log’s version of the recipe. Half of its 8 ounce contents is rum! So, of course, I immediately set out to make the drink. It was magically tasty and refreshing, but I wanted to see what some of my other books had to say on the matter. To my delight, they contained recipes with nearly double the ingredients. Will that result in double the complexity and flavor? Let’s find out. There’s nothing wrong with this drink; it’s a fun mix of fruity ingredients that makes a fun, fruity drink. Nothing is really out of balance here, yet nothing jumps out to make you notice. A bit of plain alcohol taste comes out at the end, but it doesn’t really say anything useful. A quick taste test by the lady of the house confirms my thoughts: a typical, yet nice, fruity drink. A bit more interesting than Gary’s recipe, but nearly as one-dimensional. Sweet passion fruit plus Galliano. All of the other ingredients just take a nap while these ones take over. The complexity in this recipe is surprising. The tastes of caramel, passion fruit, and tart lemon all jump around on your tongue in happy harmony. Beachbum Berry’s version from Grog Log completely blows the others out of the water. 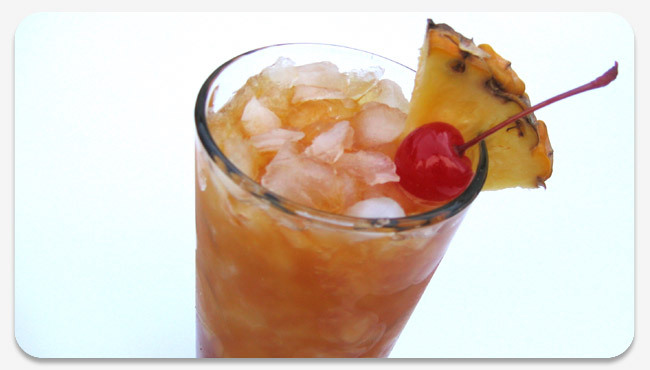 For having less than half the ingredients, it is complex, not too sweet, and allows the rum to take a prominent role. The lemon really cut into the passion fruit flavor, making its role the most subtle of the three drinks. How is it that I haven’t yet picked up a copy of the Grog Log yet!!?? I love tiki/polynesian stuff, and also am a cocktail enthusiast. This Hurricane recipe may be what finally gets me to buy this book. By the way…great site (I just discovered it about a week ago)! I love all the recipes, research, and wonderful photos. Keep up the good work! It’s obviously a labor of love. Thanks for the kind words Craiger. The power of the tiki just pulls you in and doesn’t let go. One of my good friends, Adam, has been on a crazy vintage-tiki-mug finding spree. Hopefully I’ll be able to “acquire” some of his newfound items for use in my pictures. The author of Grog Log, Jeff Berry, also has two other tiki books out which have been recommended to me. I look forward to picking them up soon. Taboo Table – This one also includes some food recipes. You can also get all three as a package on Amazon, but it doesn’t appear to save you any money. place in glass jar and refrigerate. In The Essential Cocktail (2008), he reduces the passion fruit nectar to 1 oz, and calls for some specifics (e.g, Myer’s dark rum, unsweetened pineapple juice), but it’s otherwise the same recipe, including the lime jiuce. If you should have cause to revisit this one, give it a jolt of lime to balance out all that sugar and give some life to the thing. Should you have a spare bottle of Grande Passion around, it’s good to throw some in the mix. And a little Coruba never hurt nobody, neither. the Horizon treadmill broke following a year and a half. I think that you’ll find that Gosling’s is factually from Bermuda and not Jamaica and probably far too funky for the Hurricane. While I agree that Berry’s recipe always wins you’ll probably find that Appleton’s, Myer’s or Corbua dark rums will work better in this hangover bait. At least in my far too heavy experience drinking this drink. Simply want to say youur article is as astounding. The clarity in your post iss simply cool and i could assume you are an expert on this subject.